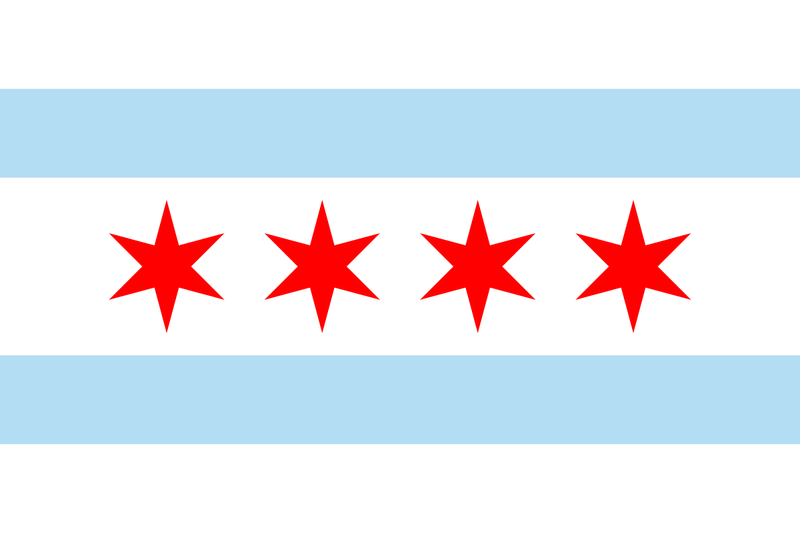 The Chicago City Flag. The three white stripes represent the North, West, and South sides. The top blue stripe represents Lake Michigan and the North Chicago River. The bottom blue stripe represents the South river and the canal. The four red stars represent major historical events: Fort Dearborn, the Great Chicago Fire of 1871, the World’s Columbian Exposition of 1893, and the Century of Progress Exposition of 1933–34. The City of Chicago, nick-named "The Windy City", is the third-most populous city in the United States. From incredible nightlife and dining to world-class museums and a full contingent of teams from all the major professional sports in America, there’s no shortage of ways to spend your time in Chicago. Since its rise to fame in the 1800's, Chicago has been the economic and cultural heart of Illinois. Chicago is the home of improvisational comedy, house music, blues, hip hop, gospel, jazz, and soul. Chicago is a multicultural city that thrives on the harmony and diversity of its 77 distinct neighborhoods. The city features a wide selection of internationally inspired cuisines. However, Chicago is most famous for Chicago deep-dish pizza and Chicago-style hot dogs. Incorporated in 1837, Chicago was ideally situated to take advantage of the trading possibilities created by the nation’s westward expansion. Since then, Chicago has remained one of the most important business centers in the world. Today, 50 percent of U.S. rail freight continues to pass through Chicago, even as the city has become the nation’s busiest aviation center thanks to O’Hare and Midway International airports. Chicago overs an area of 600 km2 and sits 176 meters above sea level, on the southwestern shore of Lake Michigan. At 190 km wide and 495 km long, Lake Michigan is the 5th largest body of fresh water in the world. The city is traversed by the Chicago and Calumet rivers. Chicago's extensive parklands, including 30 km2 of city parks, attract an estimated 86 million visitors annually. The average temperature in May is 10°C to 25°C over the course of the day, with a 33% chance of rain daily. The average length of day in May is around 14.5 hours; sunrise at 5:30am, sunset at 8:05pm. The average water temperature (lake) in May is 7°C. Tipping is required for many services in Chicago. Please refer to the table below for quick reference.